Create a standard 3D horizon as described in Creating a Horizon and Propagating a Horizon. Note: The horizon used for horizon-based RMO picking must be a regular horizon. Gather horizons are already picked across a gather and, as such, cannot be used for RMO picking. At the tab header, click the Add icon and select New Episode to configure a new episode of RMO picking. The Create Episode window will be displayed. At Name, type an episode name. 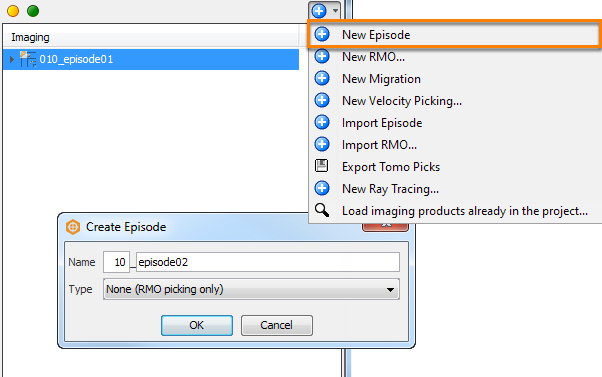 Episodes function as folders in the Imaging tree and contain the RMO picks. The prefix is used as a DUG's internal naming rule, in which users are required to name their directories (hence their episodes) sequentially. This way, you will be clear in exactly what order things were done as a typical imaging workflow involves multiple iterations of picking/tomography/migration. At Type, select None (RMO picking only). Click OK. A new episode will be displayed in the Imaging tree in the Control Panel. All data for a specific episode will be kept in your project folder in the Imaging/episode_name/ directory under which sub-directories are created for RMO picks, migration, tomography and models. Tip: To rename the episode, double click on the episode in the Imaging tree. The Edit Episode window will be displayed. Type a new name for the episode and click OK. You will not be able to change the Episode type. Select the Episode and click on New RMO Picks in the Details Panel. The Configure RMO Picking window will be displayed. Alternatively, click the Add icon and select New RMO. Select the episode in which you want to pick the RMO and click Select. The Configure RMO Picking window will be displayed. At RMO Name, type a name for the RMO picks. Select the Shared check box if you want to make the RMO picks visible to other users. Select the Gather type and the gather volume to be used for the RMO picking. 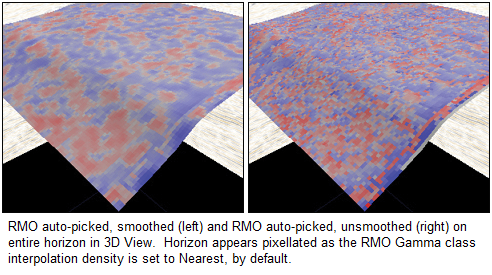 Both 2D and 3D gathers are supported in RMO picking. For 2D gather, only CMP gather can be selected for RMO picking. 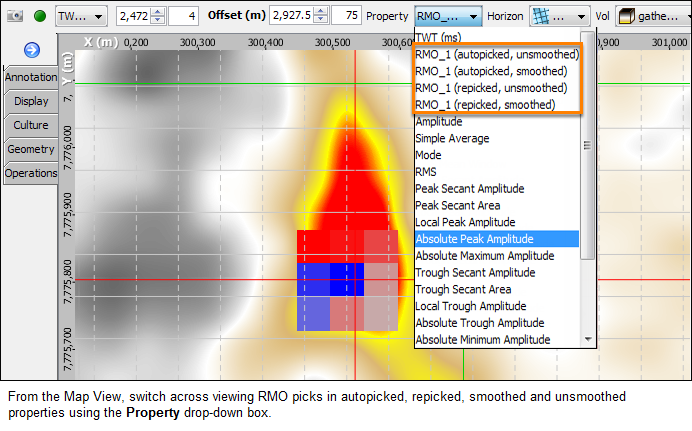 At Type, select Horizon-based RMO picking to use a horizon in the RMO picking. You can change the Inline and Crossline extents and increments for the RMO picking at Extents. By default, the extents are based on the inline and crossline extents of the gather volume. Once you have changed the extents, you can go back and define the extents based on the original extents of the gather volume by clicking Reset extents from volume. 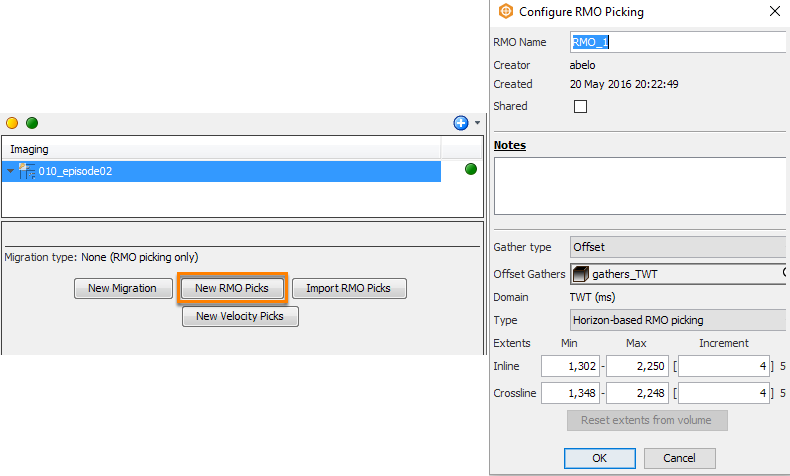 Click OK to confirm the RMO picking configurations. A new RMO item will be available as part of the episode in the Imaging tree. Select the new RMO item to display the Details Panel. In the Picking section, you can define the processing parameters. 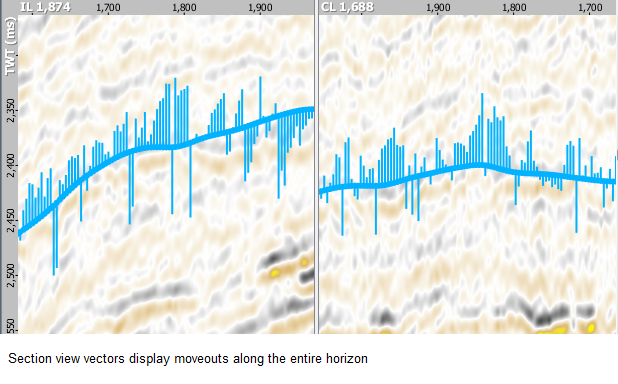 At Azimuth (degree), type the azimuth degree to be used in the RMO picking on the 3D parabolic volume. If you have picked the inner and/or outer mutes (see Manually Picking a Mute and Creating an Angle Mute), select this at Inner Mute and Outer Mute to include muting in the RMO picking. At Horizon, select the horizon you want to pick on. Only active horizons are available in the drop-down list. Select the Compute trims check box to create trims from the RMO picking. The RMO picker will always pick the best parabolic fit; selecting this check box will make the RMO picker compute the best non-parabolic fit as well. Note: This function is only available if you are using horizon(s) as seed(s) in RMO picking. 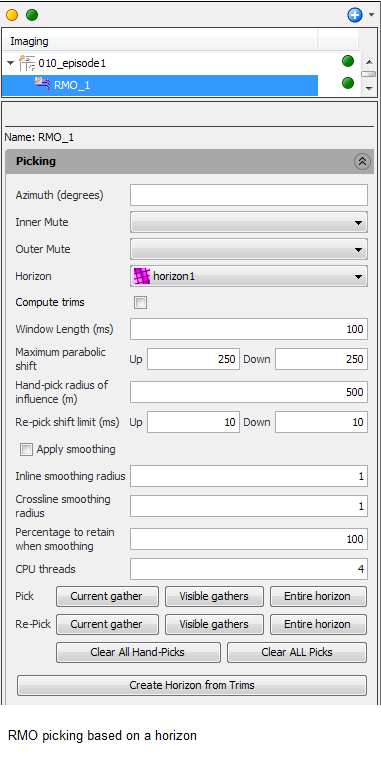 You can change other horizon picking parameters including the Window Length (ms) and Maximum parabolic shift if necessary. The Hand-pick radius of influence (m) defines the radius the system will cover when doing hand-picking. You can define the maximum allowed upward and downward shift when re-picking at Re-pick shift limit. Select the Apply smoothing check box to smooth the RMO picks and then define the smoothing radius to be applied specifically to the inline and crossline directions. This feature affects the smoothed and unsmoothed properties of the RMO picks. 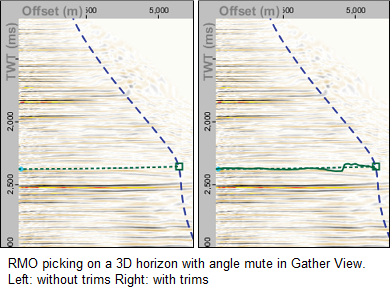 At Pick, click Current gather to extend the 3D horizon in the offset dimension for the current location on the gather, Visible gathers for all visible gathers (if you are displaying multiple gathers in the Gather View), or Entire horizon to pick RMO along the entire horizon. During picking, a progress bar with the estimated processing time will be displayed. Click Create Horizon from Trims to create a new horizon from the computed trims. You can only create a horizon from trims if you have enabled the Compute trims check box. In the Horizon tab, you will see a new horizon added in the tree. The gather horizon, which is represented by the dashed line in the Gather View, is a parabolic parameterised horizon that can be used with third party software or internally through DUG’s consulting arm for RMO correction purposes. If you have computed trims, you will see a solid line near the dashed line indicating the trims in the Gather View. You can do re-picking based on hand-picks by adjusting the handles of the dashed line as described in Re-picking Based on Hand-Picks.